That's the patent number for Pierre Lallement's velocipede, granted in 1866 in the United States. The French mechanic is widely believed to be the father of the modern bicycle. On this May 1 -- the first day of National Bike Month -- let's raise a glass to Monsieur Lallement and show everyone how we roll. 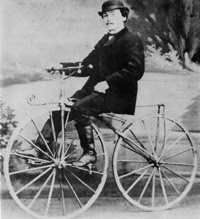 Thanks, Pierre, for inventing the modern bicycle, which a century and a half later, became my favorite hobby... the gobbler of my wallet... ;) If only he could see how many bicycle options one has today!